This category features the vases and vessels of over 75 glass artists featuring Paul Harrie, Mayauel Ward, Christie Moody, Buzz Blodgett, Stuart Abelman, Gartner/Blade, Loy Allen and Glass Eye Studio. Dynasty Gallery Acorn Rainbow Vase. 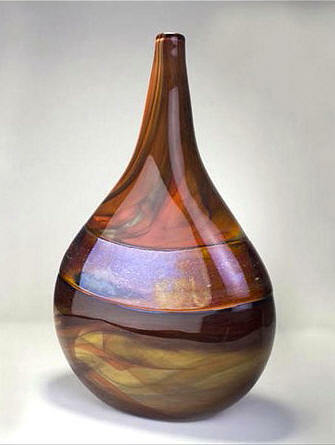 Swirls of rich deep colors wrap around this stunning vase. Interior finished with white liner. Sticker affixed to bottom with official Dynasty logo. Size: 15"h x 10"dia. Artist Bryan Goldenberg, Alabaster Sphere Vase. Created with three gathers of glass, Bryan uses his tools like a paint brush to swirl the glass. Middle band is silver color. Signature style developed in his15 years of glass making. 7" h x 9"w x 2.5"d. Available in large. Artist Bryan Goldenberg, Alabaster Tear Drop Vessel. Created with three gathers of glass, Bryan uses his tools like a paint brush to swirl the glass. Middle band is silver color. Signature style developed in his15 years of glass making. Approx. 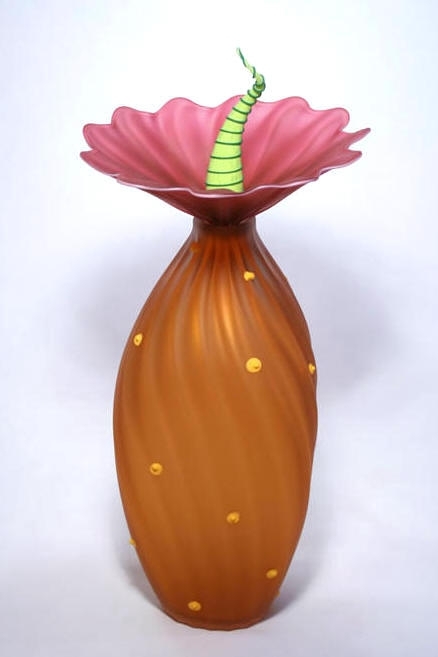 19" h x 12"w x 5"d.
GlassMaster Rick Strini's Lily Vase - Aquarium. Here is an extraordinary work of glass art. From its spectacular colors, to it's design, Rick has produced an art glass work that you will love. Notice the how the lip, done in cranberry wraps around the flower and sets it off. 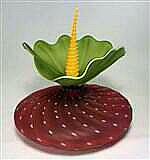 Lundberg Studios Banana Leaf Petite Classic Vase. It is signed and dated and numbered. 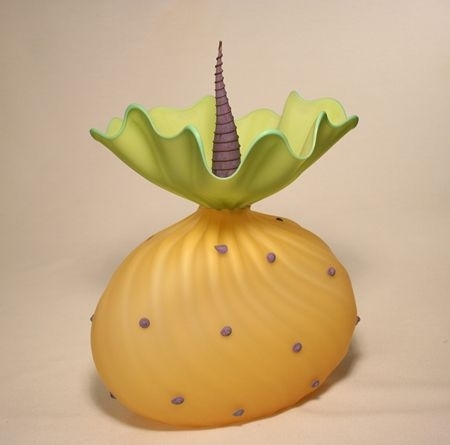 The size is approximately 7.5h x 3.4"w.
GlassMasters Danielle Gartner and Stephen Blade's Acorn Vessel with Avian Finial from their Batik Series. Inspired by their fascination with geological formations. Available in small and large size. Artist signed. GlassMasters Danielle Gartner and Stephen Blade's Covered Jar with Avian Finial Finial from the Batik Series. Inspired by their fascination with geological formations. Available in small and large size. Artist signed. 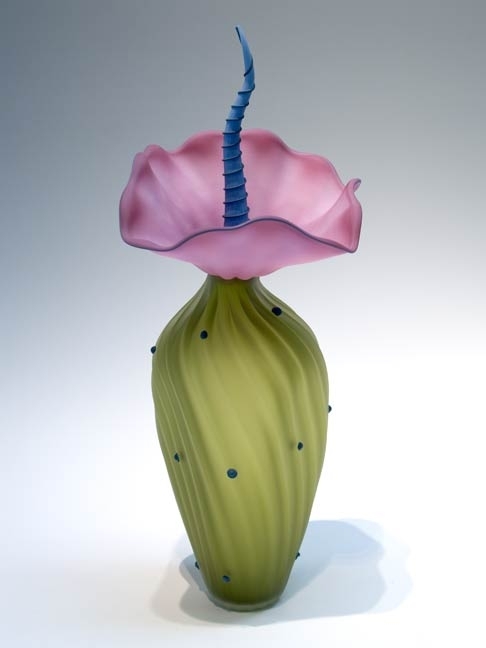 GlassMasters Danielle Gartner and Stephen Blade's Covered Jar with Bone and Tendril Finial from the Batik Series. Inspired by their fascination with geological formations. Available in small and large size. Artist signed. GlassMasters Danielle Gartner and Stephen Blade's Traditional Urn from their Batik Series. It is inspired by their fascination with geological formations. Available in small and large size. Artist signed and dated. Collected by connoisseurs of fine glass art. GlassMasters Danielle Gartner and Stephen Blade's Black Sargasso & Turquoise Covered Sphere with Avian Finial. Inspired by their fascination with geological formations. Available in small and large size. Artist signed and dated. GlassMasters Danielle Gartner and Stephen Blade's Black Sargasso Covered Jar with Bone & Tendril Finial. Inspired by their fascination with geological formations. Available in small and large size. Artist signed. GlassMasters Danielle Gartner and Stephen Blade's Black Sargasso Turquoise Footed Vessel & Avian Finial. Inspired by their fascination with geological formations. In large size approx. 19"h x 7"diameter. GlassMasters Danielle Gartner and Stephen Blade, Black Sargasso with Turquoise Cone from their Sargasso Series. Inspired by their fascination with geological formations. Available in small and large size. Artist signed. GlassMaster Mayuel Ward's Black Wildflower Bouquet Vase. Flowers in lavender, red & pink. Delicate butterfly, long green stems in multi-layers of clear glass. Flowers set against black background making the bouquet pop. Signed Mayauel Ward. GlassMasters Bob and Laurie Kliszewski's extraordinary Bobtanical Lima Vessel. 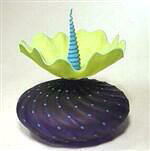 The Bobtanical Collection as well as this pretty vessel is the result of two years work in creativity and design. Shown is the Lima in pearl/green/mint lip. The Stamen is done in violet with a spiral wrap. 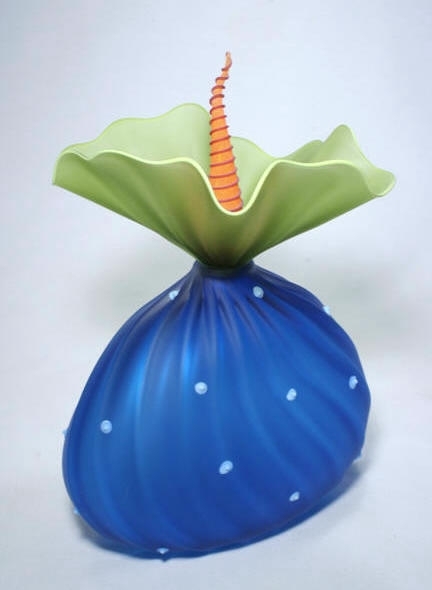 It comes artist signed/dated and is approximately 10.5h x 7.75"w x 7.0"d.
GlassMasters Bob and Laurie Kliszewski's Bobtanical Lima Vessel in aqua/olive green with hyacinth wrapped tangerine stamen. Olive green has a lip done in mint green.Entire vessel has a soft satin finish and is artist signed and dated. Approximately 10.75"h x 8.05"w 6.25"d.
GlassMasters Bob and Laurie Kliszewski, Tall Bobtanical Vessel. Done in apricot/ruby with mint green stamen in olive spiral wrap. Vibrant colors, original design and artist signed/dated. This vessel is approximately 15.20"h x 6.75"w.
GlassMasters Bob and Laurie Kliszewski's unique Tall Bobtanical Vessel. Done in aqua/opaque olive with violet colored stamen and tangerine spiral wrap. This pretty vessel is artist signed/dated and approximately 13.75"h x 7.0"w.
GlassMasters Bob and Laurie Kliszewski, Tall Bobtanical Vessel. Done in bristol green/tangerine with a mango yellow lip. Vibrant colors, original design and artist signed/dated. This vessel is approximately 14.50"h x 8.0"w.
GlassMasters Bob and Laurie Kliszewski's Bobtanical Tall Vessel in exquisite hyacinth/olive green, white stamen with midnight blue spiral wrap mint green lip. Entire vessel done w/satin finish. Artist signed/dated and approximately 14.25"h x 6.25"wide. GlassMasters Bob and Laurie Kliszewski's Bobtanical Tall Vessel. Done in olive green/opal rose with lavender stamen wrapped in midnight blue spiral. Matching midnight blue lip. Entire vessel done w/satin finish. Artist signed/dated approximately 14.85"h x 7.75"wide. GlassMasters Bob and Laurie Kliszewski, Bobtanical Urchin Vessel. Amethyst/opaque olive/mint lip with aqua stamen in spiral rap. Vibrant colors, original design and artist signed/dated. This vessel is approximately 8h x 7.0"dia. 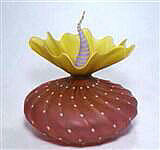 GlassMasters Bob and Laurie Kliszewski's Bobtanical Urchin Vessel, iris gold/hyacinth with tangerine wrapped ruby stamen. Iris gold part , wrapped in lavender lip, entire vessel has soft satin finish. Signed/dated, 8.25"h x 8"dia. GlassMasters Bob & Laurie Kliszewski's Bobtanical Urchin Vessel. Done in olive green/rose with a tangerine stamen in a yellow wrap. Rose petal top shown with blue lip. Entire vessel has a soft satin finish. Comes artist signed/dated and approximately 8.0h" x 8.25"dia. GlassMasters Bob and Laurie Kliszewski's unique Bobtanical Urchin Vessel. Colorful ruby/opaque-olive with tangerine stopper with mango yellow spiral wrap. It is artist signed/dated and approximately, 8.0"h x 7.5"dia. 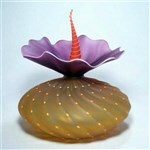 GlassMasters Bob and Laurie Kliszewski's Bobtanical Urchin Vessel in ruby/rose/iris gold with tangerine wrapped purple stamen. Iris gold part is wrapped in a tangerine lip and entire vessel has a soft satin finish. It is artist signed/dated and approximately 8.25"h x 8"dia. GlassMaster Ed Branson and Calla Vase. An exquisite flower vase in violet with translucent colors that change intensity as they move from the clear base to the top. Artist signed Branson & dated. Approximately 15.0"h x 3.25"w x 2.85"d.
David Lotton Clematis Reflection Vase with pink and purples flowers. Comes artist signed and dated. Approximately 8.5"h x 5.5"w and 8.5 lbs. Highly collectible. GlassMaster Buzz Blodgett's elegant Closed Mouth Vase in Blue Multi. Signed by artist Buzz Blodgett, dated and numbered. Sizes: Small: 6.5"h x 3.5"w and Large: 8.5 h" x 5.0"w.
GlassMasters Danielle Gartner and Stephen Blade's Lapis Closed Urn from their Strata Series. Inspired by their fascination with geological formations. Available in small and large sizes. Artist signed and dated.